When we went apple-picking-that-turned-into-peach-picking last weekend, our family decided to have a picnic on the farm beforehand. I like bringing a few things to share, so along with Apple Streusel Cheesecake Bars, I knew I wanted to bring some kind of salad. But since I was pretty far along in my pregnancy when we went, it had to be something easy. 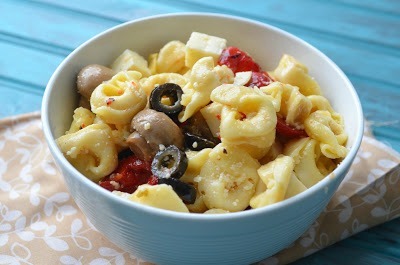 I love tortellini in pasta salad because it adds some extra cheese flavor (and you can't go wrong with lots of cheese). I choose basic summery vegetables to add to the mix, so I landed on artichoke hearts, roasted red peppers, black olives and mushrooms. Since we were going to be outside, I opted for Italian dressing to pull it all together rather than a mayonnaise-based dressing. The result was fresh and perfect for a hot summer day picnic. Or for any Labor Day festivities you have planned this weekend. Enjoy! Cook tortellini as directed on package. Drain and allow to cool slightly. Add to a large bowl. Meanwhile, chop the artichoke hearts and red peppers into bite-size pieces. 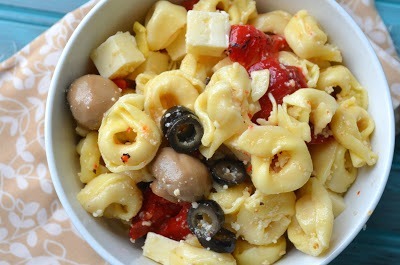 Toss the cooked tortellini with Italian dressing. 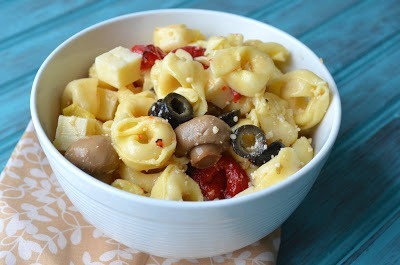 Once cooled, add the artichoke hearts, red peppers, olives and mushrooms. Add the Monterey Jack cheese and Parmesan cheese. Mix well. Add more Italian dressing and Parmesan cheese, if desired.